I won't lie. It has been a slow start around here. I valiantly attempted kickstarting the blog, only to find that time somehow slips me by everyday. I look up and its already bed time! I do feel I have passed the last couple of months in a continuous snooze and haze. It has not been a easy time health wise with trying digestive troubles, and, bouts of fatigue hitting me hard, worsened by the terrible Winter that it still is. But, I have my hopes up that the dark times will soon pass and Spring is around the corner.. surely?! Recently, in an effort to kick myself out of the downward spiral of declining into culinary obscurity, I forced myself onto several hours of ogling blogs; Much I used to do in my early days of post-crisis trauma management. Back in 2008 and 2009, and, for years after, I would spend several hours just pouring over blogs whose photography I adored. I racked up my 10,000 hours pretty quickly and my skill in photos ramped up. I figured the same intentional boot camp into finding a culinary muse would help me this time around in getting past the diet constraints and find my rhythm of sorts again. An orange potato baked, onions and garlic minced, flour dough-ed and knishes came to happen. It was a joyous couple of hours that took my mind away from my ails, put the loving caress of camera back in my hand and filled my heart with pride. Aye, pride, because when something you make with your hands comes out well, the world seems a lot barmier even in the depth of a blizzard... which, it practically was the next day! Combine all the dough ingredients and bring together into a loosely held dough. Either in the bowl or on a clean countertop, knead the dough for a few minutes until it comes together in to a tacky, soft dough ball. It will be soft and oily, which is good. Cover with cloth and leave aside while you prepare the filling. In a little oil, sauté the onion and garlic till soft. Add to a bowl. Peel and mash in the sweet potato flesh to the bowl. Mix in spices and seasoning to taste. If the mixture feels too wet add a teaspoon or two of flour, so it becomes dense. 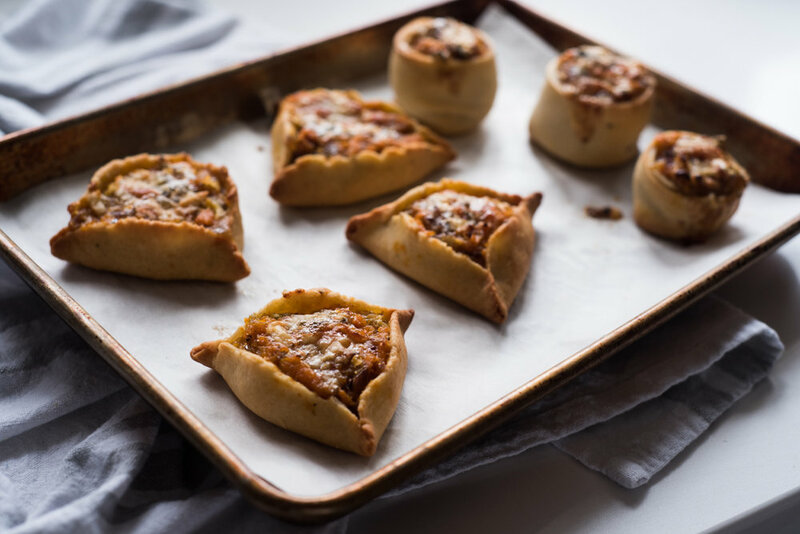 To make traditional shaped knish (closed or open), roll the dough on a lightly floured surface or wood board to 1/8th thickness, basically as thin as you can without tearing, into a long rectangle. Cut 2 inch wide strips, place a small ball of filling on one end. Roll, stretch and roll the dough into shape. Here is a video to help with the knish rolling that I looked up to get an idea of how to make it flaky. It's stretch and pull, and roll. Hint: The triangles are easier, see below. To make the fancy triangle 'ears', divide the dough into 6 small balls. Roll each into 3-4 inch rounds. Place a tablespoon or so of filling in the center and pinch the sides into a triangle. Place on prepared baking tray and bake for 18-20 minutes until the cheese is melted, filling looks to be bubbling and the dough cooked through. Remove to rack, cool for a few minutes and enjoy. It stays good in a sealed container for upto four days.